Searching across the very best flight deals from all corners of the globe, Opodo are an Internet-based travel agency which aim to bring you brilliant fares no matter where you’re flying to. Take advantage of their exclusive rates and make additional savings with an Opodo voucher. All you need to do is pick up a free Opodo discount code from our website before you book, and then it’s up, up and away! Founded by an association of the biggest European airline providers including British Airways, KLM and Lufthansa, Opodo aims to offer their customers great flight deals by searching across the whole spectrum to bring the cheapest fares directly to your desktop—without you needing to spend hours scrolling through hundreds of different websites to locate the best price. Although their headquarters are stationed in London and they have built a successful business in the UK, they also operate across fourteen different European countries included Germany, France, Switzerland and many more. If you’re booking from Nordic countries you will find them under the name “Travellink” instead. 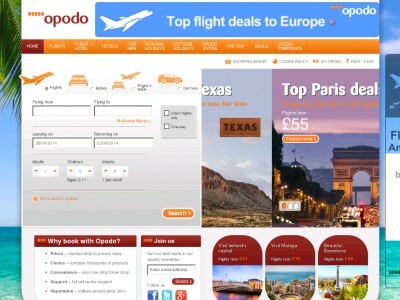 As well as searching for flights, Opodo are also well-equipped to find you great prices on hotels, car hire, city breaks, package holidays, excursions, ski holidays and cottages too; so you can make light of holiday planning, and concentrate on the more important details—like what you’re going to wear! Make an extra saving on your booking when you use their online service and redeem a free Opodo voucher code at the checkout, and then all there’s left to say is Bon Voyage! Stop by our website to pick up your free Opodo voucher and then swoop over to the Opodo homepage to begin browsing. If you already know exactly what you’re searching for then use the labelled tabs to locate the relevant department, or get inspired by their slideshow for tips and ideas on the latest destinations and offers. Once you’ve located your flight, hotel or similar product and you would like to book, simply select them and then review all of the information before you complete your confirmation. When you are ready to continue to the checkout, you will be able to locate the “e-voucher codes” box just beneath your final price, where you can enter your Opodo discount code then click “Re-Price”. The discount will be automatically applied and your total price updated. After entering your personal information and payment details your order will be confirmed and soon on its way out to you from Opodo, have an amazing time on your trip, and all at a great price too! Whatever you’re a frequent flyer jetsetting your way from London to LA, or you’re just nipping over to Spain for a week away with the girls, when using Opodo voucher to book on their website you will be able to search over 500 airlines to get the very best price on your travel plans! Seek inspiration with a flick through their carefully curated destination ideas on the Opodo homepage, then go on to customise your search. Enter in all of the search criteria you possibly can to give Opodo the best chance at finding you brilliant deals then click the large “Search” button. Your search results will be displayed after a couple of moments, remember—Opodo searches over 500 airlines, so it may take a couple of minutes but will be worth the wait! Using the various search filters on the left hand side of your screen you can tailor your search to fit exactly to your specific needs and then click on the fares you would like to book and click “select” or you can also “add to basket” depending on your choice. If you have a Opodo discount code locate the “e-voucher codes” box beneath your final price, where you can enter your Opodo voucher code then click “Re-Price”. The discount will be automatically applied and your total price updated. If you wish to, create a user account with Opodo to make booking next time even faster and more convenient. You can also choose to checkout as a guest if you prefer. Complete all your personal details and delivery options as well as your payment information, then simply wait for your ticket confirmation to arrive per e-mail! Allow their amazing deals on flight tickets to do the rest by clicking over to their website to get started with their online search tool. Just remember to collect your free Opodo voucher from us before you arrive! British Airways lures bargain-hunters with amazing coupons and discounts. But wait, that's not the end of it! In Travel category you will find plenty of voucher codes to shops such as Budget Rent a Car, Ebookers or Expedia. All of the tickets sold via the Opodo system are “e-tickets”, this is a paperless ticket which only exists online and will be sent to you via your email address. This will contain all of the information you need to take with you to redeem the ticket. If you wish to you can print this and take it with your travel documents, or simply store the information in your smartphone or tablet device. Although Opodo want to make sure that you are perfectly happy with your booking, please note that you are complying with the cancellation and return policy of the provider you choose to book with via Opodo, and therefore you must review this carefully before you book on the provider’s own website. For more information about the way in which Opodo deal with complaints about their services and enquiries please consult their FAQ section on the website. Be sure to keep them in your newsfeed, and share the latest updates with friends as soon as the new Opodo voucher becomes available! Buy now online at www.opodo.co.uk. If you’re anything like me, by the time you get around to booking your flight you’ll have missed out on the deals sensible people secure by booking in advance. Of course, there’s always Opodo—with an Opodo voucher or Opodo promo code the very best flight deals are available to you no matter how late you remember you’re meant to be in Las Vegas this weekend. So whether you’re making good on a promise with your Opodo promo code or just vacationing with your Opodo voucher code, take the time to check Opodo before you book something you might regret.